This article is about the band. For the folktale, see Grateful dead . Jerry Garcia and Mickey Hart, 1987. The Grateful Dead was an American rock band formed in 1965 in the San Francisco Bay Area. The band was known for its unique and eclectic style, which fused elements of rock, folk, bluegrass, blues, reggae, country, jazz, psychedelia, space rock and gospel—and for live performances of long musical improvisation. "Their music," writes Lenny Kaye, "touches on ground that most other groups don't even know exists." 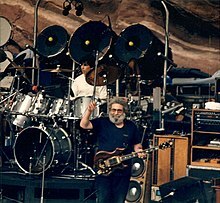 The fans of the Grateful Dead, some of whom followed the band from concert to concert for years, are known as "Deadheads"; they are renowned for their dedication to the band's music. Many fans referred to the band simply as "the Dead". As of 2003, the remaining band members who had been touring under the name "The Other Ones" changed their official group name to "The Dead". Deadheads continue to use that nickname to refer to all versions of the band. The Grateful Dead's musical influences varied widely; in concert recordings or on record albums one can hear psychedelic rock, blues, rock and roll, country-western, bluegrass, country-rock, and improvisational jazz. These various influences were distilled into a diverse and psychedelic whole that made the Grateful Dead "the pioneering Godfathers of the jam band world."